32.8 cm x 50 cms = 1640 sq. cms. 4.4 cms for display ads & 6 cms for appointment ads. Fraction of a centimeter will be treated as one full centimeter, being rounded off to the next higher centimeter. the full height i.e. 50 cms., length. 5 cms. x 4.4 cms for display ads. and in multiples of minimum width. 5 cms. x 6 cms for appointment ads. and in multiples of minimum width. Front & back page ads as stipulated under separate headings. Maximum Size - 25 cms x 18.6 cms. Minimum Size - 20 cms x 13.9 cms. Minimum Size - 10 cms x 9.1 cms. Multicolour advertisement will be accepted only for Front page, Back page and appointment pages and the material should reach our office strictly within the specified time. Soft copy of ads made in pdf / corel draw / eps formats. No dispute / protest / claim in respect of any bills will be entertained, unless made within one week of publication. Under no circumstances, shall payment for any bill or any portion thereof be held back as disputed. 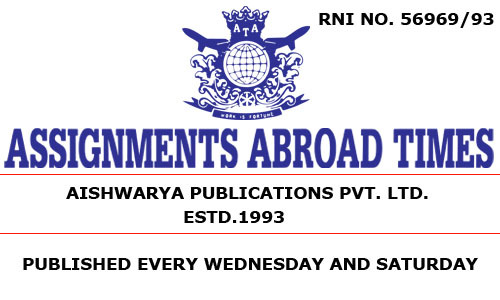 Drafts / Cheques are to be drawn in favour of "Aishwarya Publications Pvt. Ltd." only.